Need we say more? We have been getting emails every week from people asking us when Ben & Jerry's new vegan options will be released in Norway and after a long wait we almost can't believe the day is here. The first flavours to be released will be Chunky Monkey and Chocolate Fudge Brownie. Both varieties use almond milk instead of dairy and are gluten free too! We have been told that it will cost around 85-90kr for a tub. One or two Meny stores and a few independant vegan stores already have these in now, but they're not officially launched yet. The first places you will find this will be at Meny, Spar, & Kiwi supermarkets in week 8, and it will come to other supermarket chains soon afterwards. What the hell is Oumph!? you might say. Or not, as they are arguably the most popular meat substitute product sold in Norway, so the chances are that you know all about them already. They describe their food as 'epic veggie eating', and we agree. Their soy protein products are delicious, easy to cook, and crazy good for the environment. Last year Pulled Oumph! won Nicest New Product in The Nice Awards. Now they are taking things to the next level with the release of an Oumph! Italian Style Pizza. A stone oven baked base, covered in Oumph, red and yellow peppers, red onion and vegan cheese is a winner in our books. We are unsure of what the price of this pizza will be, but assume it will a bit more expensive than a Grandiosa. The first places you will find this will be at Meny, Spar, & Kiwi supermarkets in week 8, and it will come to other supermarket chains soon afterwards. I don't know about you, but one thing I've been missing in my life is a nice ice cream cone, especially in the summer, or on the 17th May when everyone else is tucking into their dairy cones and you sit there, smile, and say 'no thank you' whilst gritting your teeth. 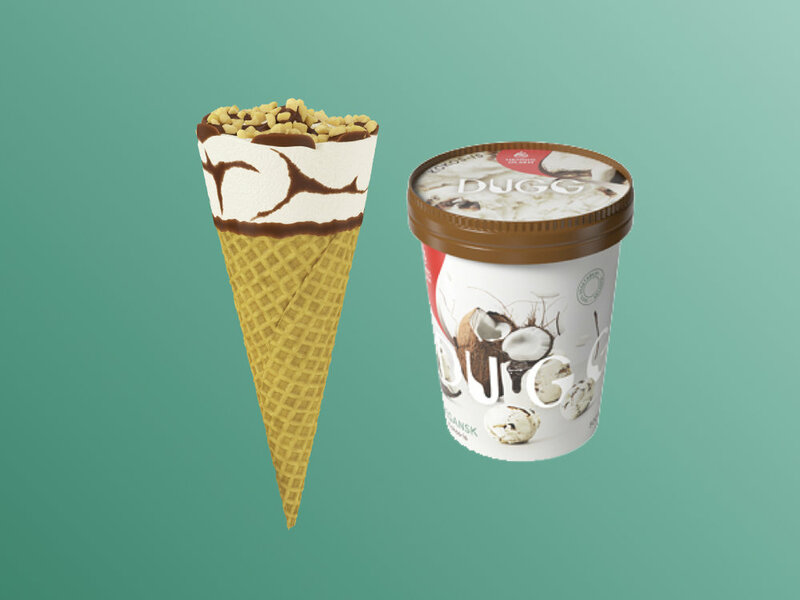 For a long time we have been asking big Norwegian ice cream companies to make something we can enjoy too and now Hennig-Olsen have come through with not one but two new totally vegan products! This baby is totally vegan, and gluten free too. It's a classic: vanilla ice cream in a wafer cone with chocolate and a sprinkle of nuts on top! Exactly what we were hoping for. Whereas the cone is the ice cream of choice when you are on the go, this one is more suitable for a night in front of Netflix. It's a nice tub of ice cream made with coconut milk and combined with a rich chocolate sauce, perfect for sharing. You can find both of these in supermarkets from week 8, the vegansk krone is may also be sold at independant ice cream stores too. Make sure you ask your favourite place if they can order it in for you. Other products launching in week 8 include a brand new vego schnitzel from Anamma, a coconut drink from Naturli, and a fantastic new meat substitute called 'Pulled Oats' which you can get from Eurospar. (Edit: Their producers just got back to us and said that the Pulled Oats may come a little later than week 8.) We also know that there are new products to be released from Berit Nordstrand (which we will have more info about later in the month).